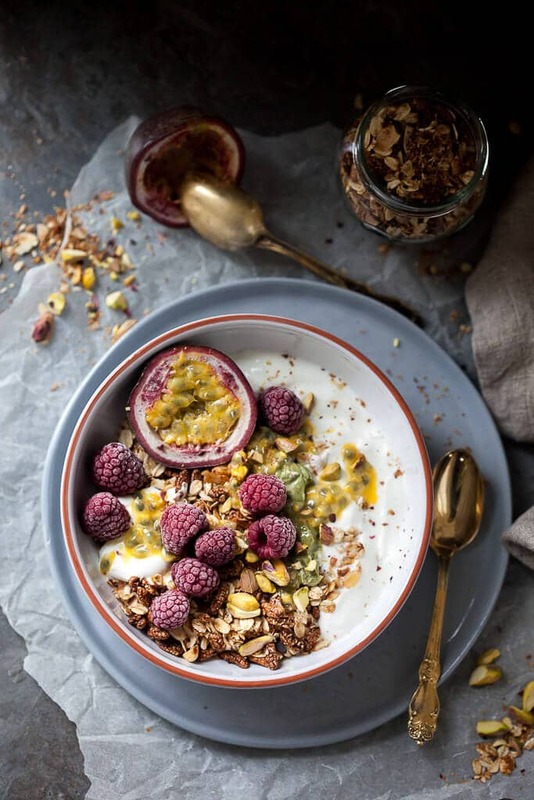 This Raspberry & Passion Fruit Greek Yogurt Granola is simply DIVINE! So remember back before Christmas when I made this fabulous Dark Chocolate Breakfast Granola? Not only did I give it out a LOT as gifts to family & friends, but I also made a few batches for our own use. And we like it the most with some Greek Yogurt and topped with fruit. As it is currently the dead of winter, I try to make the best of frozen produce. The choices in the local shops are sadly limited, but that is to be expected. I am hardly one to buy tomatoes in January, or peaches imported from Chile (yes, I actually saw that today in the produce section!). I mean, I love peaches, but in July when they are locally abundant (fresh & cheap!). So we eat plenty of winter greens, radicchio, winter staples and – of course – frozen produce, such as peas or raspberries. 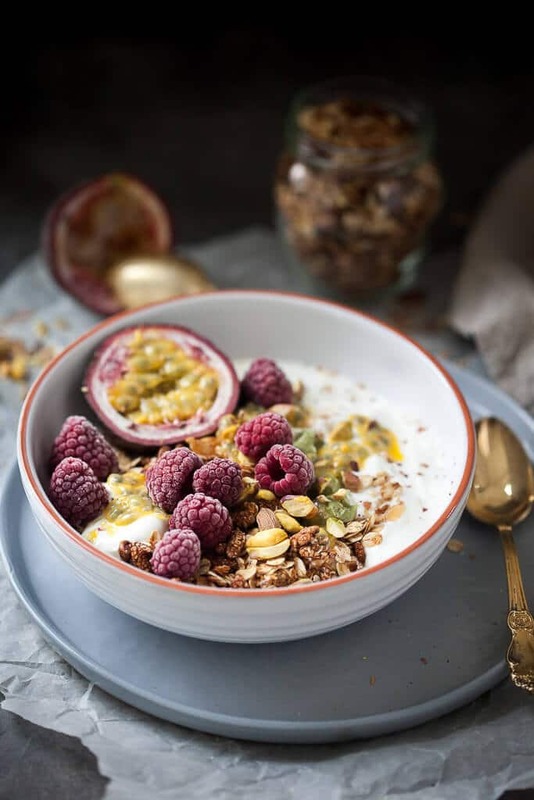 So while we’re currently still freezing, this lovely Raspberry & Passion Fruit Greek Yogurt Granola will keep us warm and fuzzy inside until springtime. 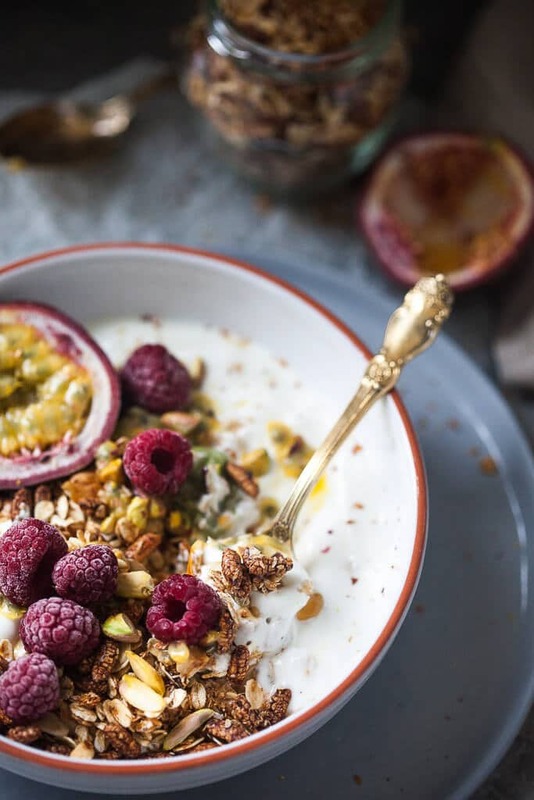 Put Greek Yogurt in a bowl, add a few tablespoons of granola and a teaspoon of pistachio cream (optional!). 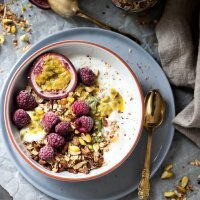 Slice open the passion fruit, scoop out the pulp and put it on the granola and yogurt. Add raspberries and a few chopped pistachios. Serve.